Impressive Inscriptions Bookmark Boutique specializes in making made-to-order bookmarks with the customers' text and/or photo (for a baptism, wedding, retirement, memorial, family reunion, graduation etc., there is often a photo of the person included). They literally make them for just about any occasion, from baby and bridal showers to school-related, birthdays, wedding, religious occasions, anniversaries of weddings, schools, institutions, etc. They sent me some samples of bookmarks they have made for customers and they were so wonderful! It is amazing all the cool things they do! Rosemarie and Rose Marie are friends and co-owners of Impressive Inscriptions Bookmark Boutique, LLC, a business founded in 2002 which we operate from our home studios. 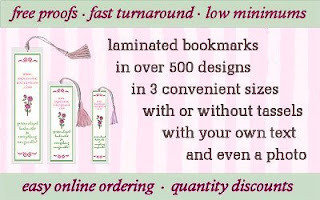 Our custom, made-to-order bookmarks have been delighting thousands of customers through the years. With over 500 original designs and the ability to customize the bookmark with your own text and optional photo, our bookmarks can be used as favors or keepsakes for any occasion imaginable. Our high-quality laminated bookmarks are available in 3 sizes, with or without tassels, to accommodate the text, photos and budgets of every customer. Easy online ordering and friendly customer service make shopping at Impressive Inscriptions an enjoyable experience from beginning to end ! Impressive Inscriptions Bookmark Boutique I get to get 4 lucky winners the set of the 4 bookmarks shown above! How awesome! Those are so cute! These are so neat...great party favor idea! Also would be great for our farm summer reading fun! Okay! I'm hooked! I love these!! I am so going to order some of these! Thanks Shauna for being so awesome! Those are really, really cute! I really think I will use these for the baby shower I am in charge of coming up! How fun! I have your adorable button oh ya! I would love to win. I need something better than my junk mail as a bookmark. Cool another chance over here! Always can use bookmarks, count me in! What a great giveaway! I'm always needing bookmarks. Thank you. those bookmarks look great...and would come in so handy. How cute, I'd love to put them in my sister's Christmas stocking! I posted this on my Facebook page for my 889 friends to see! Love the bookmarks! Please enter me; and yes, I follow. I am following your blog, awesome bookmarks, i love bookmarks, be happy to win them. Bibliophiles can never have too many bookmarks! Please count me in. Wow thsese are cool to have. Thanks again! Definitely something I can use! perfect for cold weather reading! Awesome! My whole family reads! These would make great stocking stuffers!